GRANTSVILLE, Utah – It’s not an easy task to follow in your dad’s footsteps in racing … especially if your father is a champion. Just ask Canaan O’Connell, the 22-year-old son of four-time Pirelli World Challenge GT champion Johnny O’Connell. 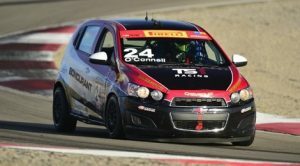 The younger O’Connell is doing just that this weekend at the Utah Motorsports Campus, as he makes his pro racing debut in the Pirelli World Challenge Grand Prix of Utah Motorsports Campus presented by Energy Solutions. O’Connell will compete in the No. 24 TechSport Racing Chevy Sonic in the TCB division while his father, Johnny, wheels his popular red No. 3 Cadillac Racing Cadillac ATS-V.R. in the highly-competitive GT class. The older O’Connell dominated last year’s PWC GT action in Utah with a double-victory, which led to his fourth consecutive series title. Just as personable as his outgoing father, Canaan knew the battle that was ahead of him to get in the driver’s seat. The younger O’Connell has been racing in 2016, competing in a Mazda Miata in the NASA series, but he is looking forward to jumping to the Pirelli World Challenge this weekend in Utah. Canaan O’Connell is thankful for the assistance of his father and some other friends and associates that helped to give him this opportunity. However, he knows he has to show his talent in the car too.